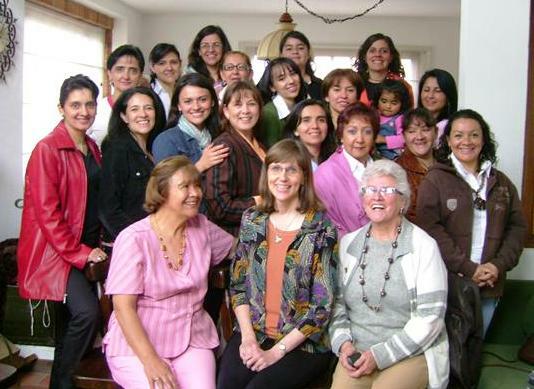 In 1994 a group of women from the local churches we worked with in Bogota, Colombia, met together at fellow missionary Sheran Killins' home. Sheran and I were the only non-Colombians. We prayed, laughed, talked and dreamed about having a conference for mothers on raising children. All of us were mothers, some had babies (like me) and some had grandchildren. We were all trying to figure out this parenting thing, how to do it God's way, and how to help other women raise obedient, godly children. Over the course of a year and half we got it done! Somewhere along the way we decided we needed follow up material, so we came up with the idea of a newsletter for mothers. We called it "Mama Eres Increible" (Mom, You're Incredible!). I was excited about being able to use my desire to write as a ministry. At home I wrote out a list of topics I thought I would be able to write about. After brainstorming for a few minutes, I looked over my list and realized that they pretty much centered around family mealtimes. Getting to know your kids? Table talk! Teaching kids manners? You could do that at the table. Chores? Meals definitely create work. Learning about other people? Invite them to your table. Family Devotions? No time like when they are already together to do that! And as I looked around at the families I saw in our local churches, I didn't see many of them ever having meals together. So I got the idea of writing the various articles and putting them together in a book. I started writing and writing. In the past, when I had written other things in English I felt like the words danced, but in Spanish they seemed to just lie there on the page. So I edited and then tossed most of what I wrote. It was so didactic, so imperative. "You should...you must...you need to." Then I talked with a friend about her book and realized it was full of stories. I started over. I wrote down my memories of growing up. I talked to other people about their family meal times. I had a long, multi-session "interview" with a friend (who is a pedicurist) as she worked on my ingrown toenail! I remembered what Jim and I had done with our children. Inspired, I tried new things with our kids. And I wrote it down. It took about 2 years to write and 5 years to get it published. We paid for the art teacher, Iain Campbell, at our kids' school to do pencil illustrations for that first edition. Then we paid for a Colombian artist to put together the first cover. The publisher wanted the book in English, too. So I found myself with the odd task of translating my own book back into my native language! Multiple people edited it in both languages. And finally it came out. But really, I was the only one advertising the book. A few years later, one of the middle school teachers at our kids school got a hold of a copy. Much to my surprise, when we went to Middle School orientation, she stood up to introduce herself and she said, "I'm Kathleen VanZandt and I'll be teaching your children Language and History. But what I really want to talk to you about is a book that revolutionized our family life. I only wish I'd read it earlier! Each of you needs to read it!" She's still my biggest fan! The owners of the publishing house were getting ready to retire and said I could take my book elsewhere if I wanted. Armed with Kathleen's testimony, I took the plunge and made a book proposal to ECS Ministries. They accepted! More editing, a new chapter to bring the reader up-to-date on my family, lots of hard work by Mark Wainwright who's in charge of publications, and my good friend, Sue Tyler, editor par excellence, and a new cover by Ron Brancato later, the book is available to a wider audience than ever! at a family through a window! If you are interested in reading the book for yourself or getting it for someone else, it is available here. You can also read the first two chapters there. Happy Mothers Day all week long! Great story Sharon :) It is interesting to hear how people's art or books came to be. Thanks for sharing! thanks, Jessica. I love back stories. They are almost as interesting to me as the original story. Roxy, I'm so glad you had family meals. I hope you enjoy the tea party with your grandson. I am just getting to that stage with my granddaughter. I am a big believer in family time at the table, too. Loved the story behind the book! thanks for sharing!